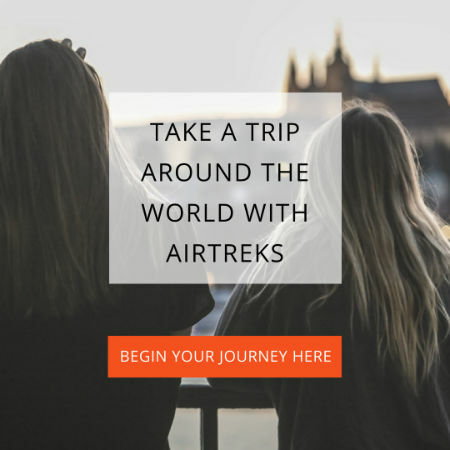 Traveling is often about trying the unusual and attempting to experience a different culture in the country you’re visiting. 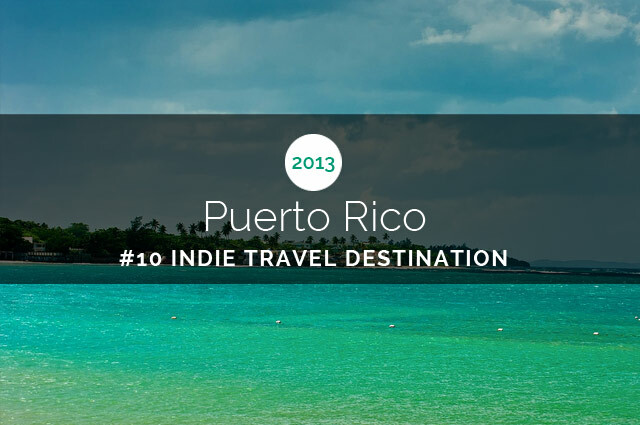 One of the best ways to do this is to try the foods locals eat. They may not be to everyone’s tastes, but the following foods, considered weird and bizarre, or even dangerous to outsiders, are considered delicacies in their countries. 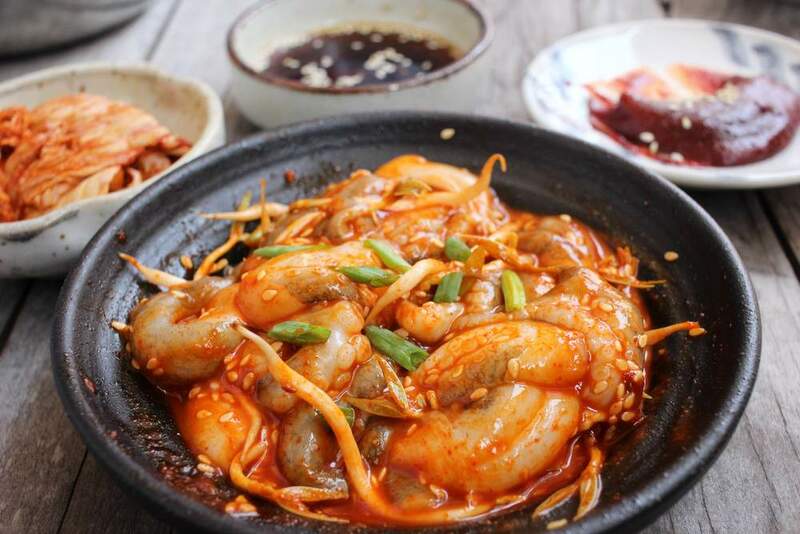 Although eating these foods might seem like a form of ‘extreme dining’ to us, they’re tasty everyday or special occasion fare for the people who eat them. 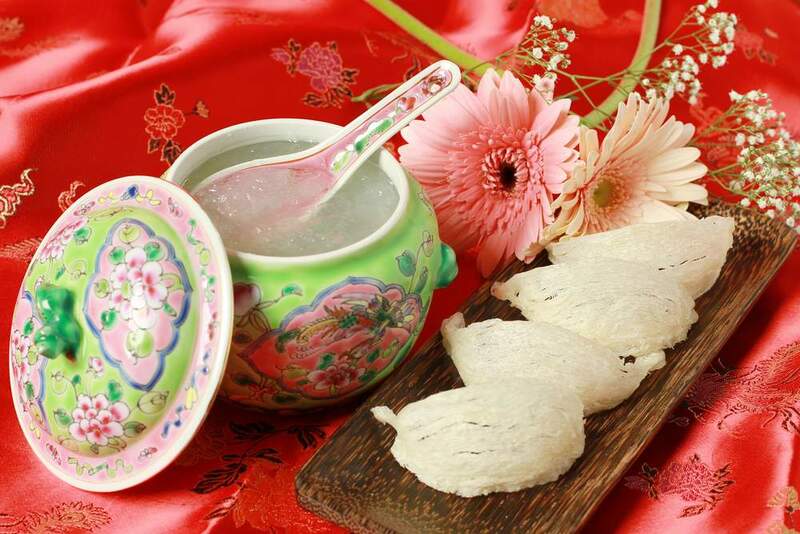 You wouldn’t necessarily think a birds nest would be edible, but the Chinese use Swifts’ nests to make this soup, known as the ‘Caviar of the East’. Right now you’re probably imagining a nest made out of twigs and leaves, but Swiftlets make their nests predominantly out of saliva. It’s something in the saliva of the bird that makes it have this unique gelatinous, rubbery texture and it’s one of the most expensive animal products consumed by humans. It’s expensive because the swiftlets build the nests during breeding season over a period of 35 days and nests can only be harvested around three times a year. The nests are typically built in coastal caves and collecting them is a treacherous process involving nimble climbing skills, which adds to the hefty price tag. With an increase in demand for birds nest soup, manmade nesting sites have become common. Hong Kong and the US are the largest importers of birds’ nests and a bowl of the soup can cost between $30 to $100 per bowl, whereas a kilo of nests can cost between $2,000 and $10,000. 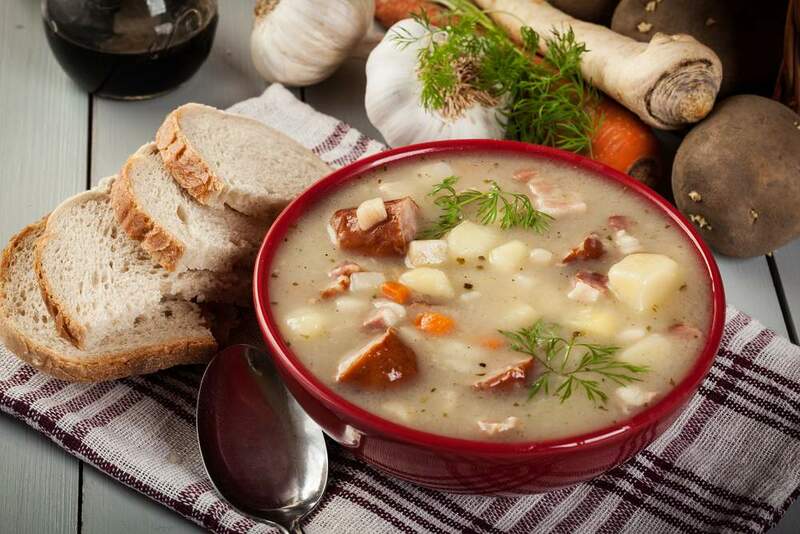 A tradition for centuries, the soup’s believed to have aphrodisiac qualities in addition to its nutritious protein content. The eensy weensy spider climbed up the water spout…if you suffer from arachnophobia you probably don’t want to try eating these eight-legged monsters. 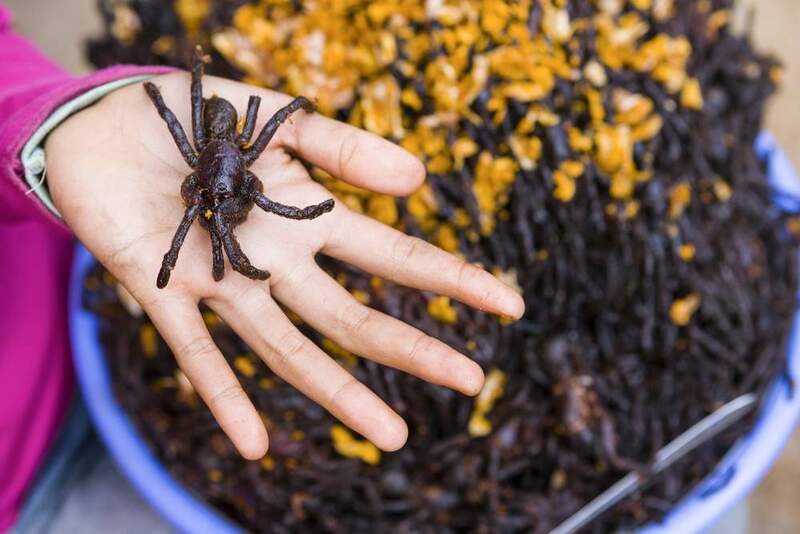 They’re not tiny little house spiders, they’re great big tarantulas and you can buy them from street vendors in Skuon, Cambodia. They’re fried whole – legs, fangs and all. They were first discovered to be edible by starving Cambodians in the bloody, brutal days of the Khmer Rouge rule and have gone from being the vital sustenance of these people to a delicacy tourists come from far and wide to try. The black hairy arachnids, found in the jungle around the market town of Skuon, have become a source of fame and fortune for the region as busloads of people stop to try them on their way to other places. For only a few cents, they taste delicious plucked straight from the burrow and pan fried with a bit of garlic and salt. They’re crispy on the outside with a gooey body on the inside with a flavor resembling cricket or chicken. You’ve got to be careful with this delicacy or you might end up in the morgue. The deadly Puffer fish, or fugu, is the ultimate delicacy in Japan even though its skin and insides contain the poisonous toxin tetrodotoxin, which is 1,250 times stronger than cyanide. That’s why in Japan only expert chefs in licensed restaurants are allowed to prepare it. Only try this at licensed restaurants, otherwise, you could end up paralysed and eventually die from asphyxiation because there is no known antidote. Fifteen people died in Thailand when the fish was declared illegal and people started dying it pink and passing it off as salmon. This Filippino dish, called Balut, isn’t unlike a chocolate Kinder Surprise, these eggs harbor a surprise, although it’s not a plastic toy, but rather a chance to eat your chicken and your egg at the same time. Fertilized eggs are boiled just before they’re due to hatch, so your yolk oozes out followed by… a chicken (or duck) foetus. They are cooked when the foetus is anywhere from 17 days to 21 days depending on your preference, although when the egg is older the foetus begins to have a beak, claws, bones, and feathers. In Filipino culture, Balut is almost as popular as the hot dog in America and street vendors yell out ‘Baluuuuuuut’ as they push their carts down the street. 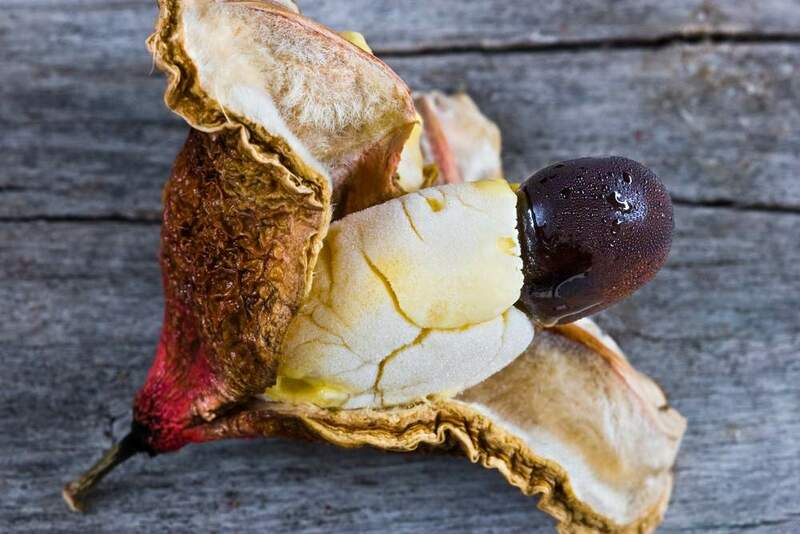 They’re popularly believed to boost the libido and are also a hearty snack full of protein. 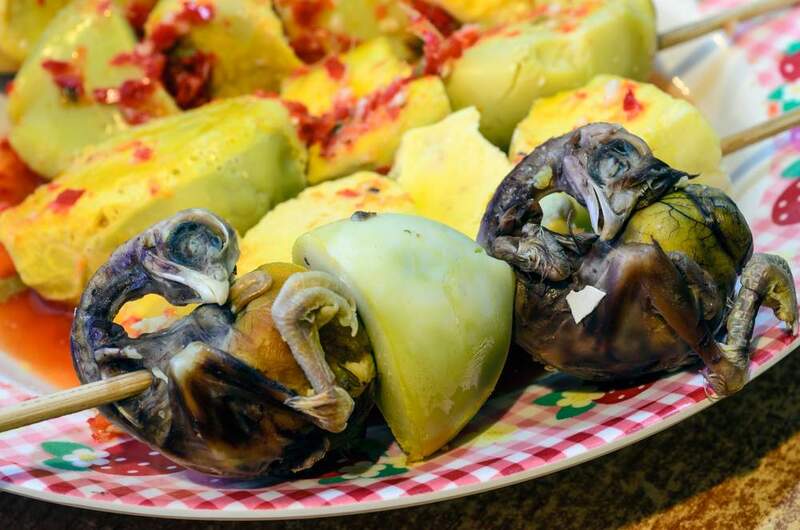 Balut are usually guzzled down with beer and are prepared with a pinch of salt, lemon juice, black pepper and coriander, although some Balut eaters prefer it with chili and vinegar. The way to eat Balut is to crack open the egg, sip the broth and then eat the yolk and foetus. This Sardinian cheese is riddled with insect larvae. 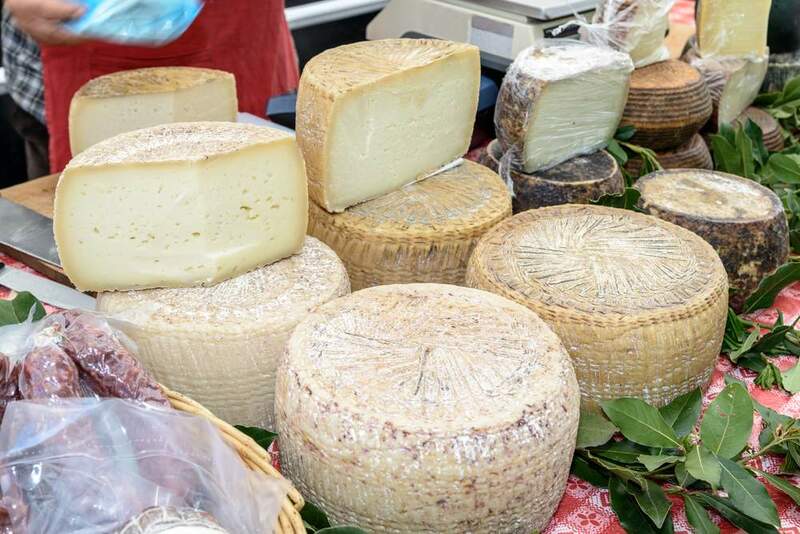 “Casu Marzu” means ‘rotten cheese’ and is most commonly referred to as ‘maggot cheese.’ It’s now been banned for health reasons but can still be found for sale on the black market in Sardinia and other parts of Italy. This sheep’s milk cheese is basically Pecorino, which has had the larvae of the cheese fly, Piophila casei, introduced into it. Fermentation occurs as the larvae digest the cheese fats, and the texture becomes very soft with some liquid seeping out. The cheese has to be eaten when the maggots are still alive because when they are dead it is considered to be toxic. Surstomming is fermented Baltic herring and can be found on supermarket shelves all over Sweden, although you probably won’t see it next to the Ikea meatballs. The herring is caught in spring when it is just about to spawn and is fermented in barrels for one to two months before it is tinned where the fermentation continues for several months. The cans often bulge during shipping and storage because of the continued fermentation process. Certain airlines have in fact banned these cans from being taken on flights, as they consider the pressurized cans to be potentially dangerous, like fireworks and explosives. When the can is opened the smell is usually what will get to you first as the fermented fish has a really strong odour. 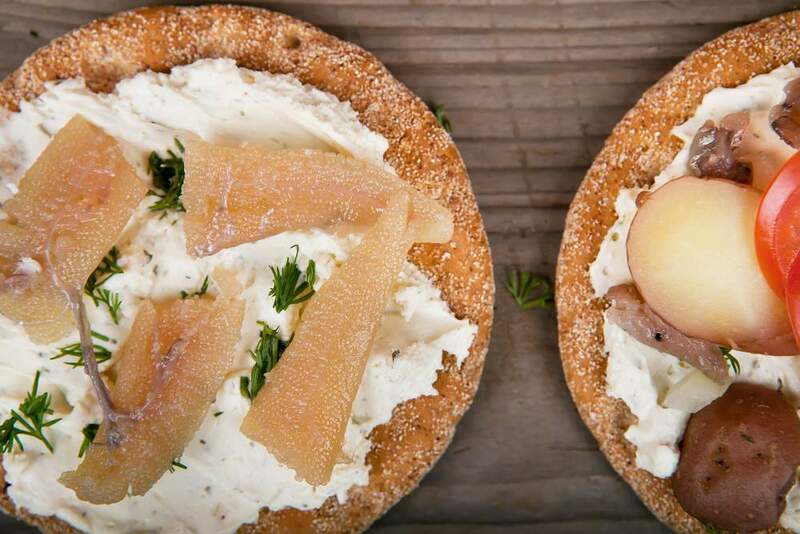 It’s usually eaten with a type of flat crispy bread and boiled potatoes. Sometimes people drink milk or water with it, but beer’s the best way to wash it down. 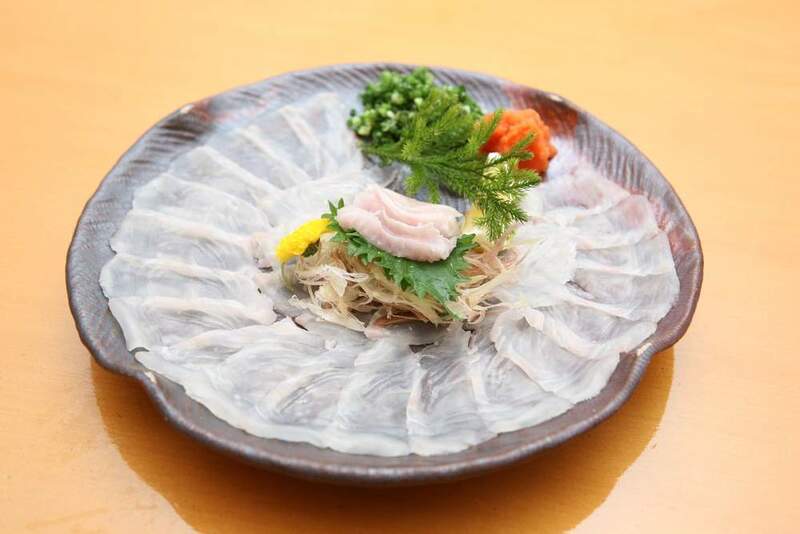 Sannakji is a raw dish consisting of live octopus typical in Korea. Live octopus is cut into pieces, lightly seasoned with sesame oil and served immediately, the tentacles still squirming on the plate. Eating live octopus is a serious challenge. Beyond the mental challenge of trying to get your head round eating something that’s still alive, but there’s the physical difficulty of fighting with your food, as the tentacles stick to any surface they touch. The first hurdle is to get the tentacles off your chopsticks, and once the octopus is in your mouth it will suction to your teeth, the roof of your mouth and your tongue essentially trying to preserve its own life. Some locals consider it a “party in your mouth” as the tentacles wriggle while you chew. Special care should be taken to chew thoroughly, however, because if the suction cups stick to the throat, you might choke. You might want to think twice if someone offers you a cup of this coffee when you pop round to their house in Indonesia, or maybe not. Kopi Luwak is the rarest, most expensive gourmet coffee in the world. Sounds divine right? It’s actually made from the excrements of an Indonesian cat-like creature called the Luwak. The Luwak eats only the ripest coffee cherries but its stomach can’t digest beans inside them, so they come out whole. The coffee that results from this process is said to be like no other, and the stomach acids and enzymes that perform the fermentation of the beans give the coffee a special aroma. This process takes place on the islands of Sumatra, Java, and Sulawesi in the Indonesian Archipelago. 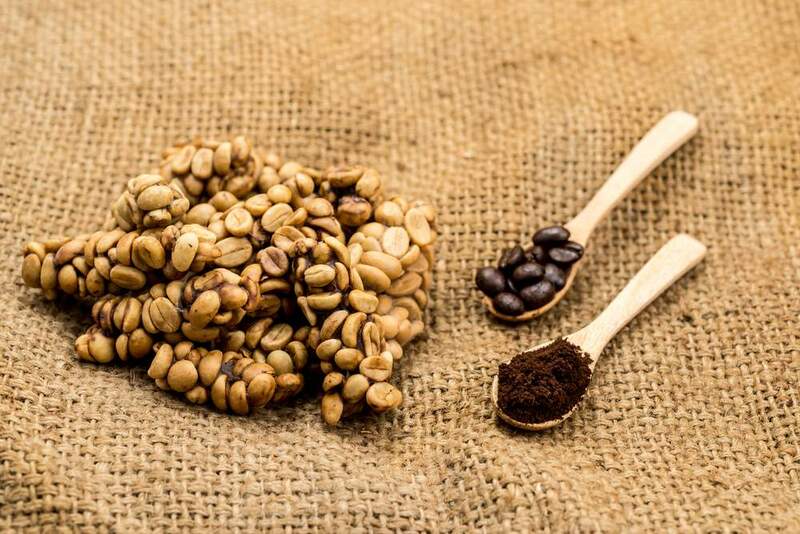 With an expensive price tag of anywhere between US$120 – $300 per pound, you might want to start saving now if you want to try this gourmet coffee. Sometimes referred to as the ‘clown of the ocean’ or ‘sea parrot’, the puffin, with its colourful beak and clumsy behavior, is considered an adorable bird. The sight of a puffin flapping its wings and jumping from a cliff to generate enough lift to become airborne is enough to make anyone go ‘aaaah’. In Iceland, however, these seabirds have been a source of sustenance for Icelanders on the islands for centuries. Iceland is home to one of the world’s largest colonies of puffins and ‘sky fishing’ is a sport which involves catching the low flying birds in a big net. The best place to catch a puffin or two is in the Westman Islands, where they are sustainably harvested to prevent them from going extinct. Hunters break their necks, skin them and then eat the fresh heart raw while it’s still warm as a traditional Icelandic delicacy. Puffin is like a fishier version of chicken or duck. It is often smoked, grilled or pan-fried. TV chef Gordon Ramsey caused quite a stir when he was seen eating it on TV. Fancy a different sort of wine? A bouquet of reptile with some notes of venom perhaps? 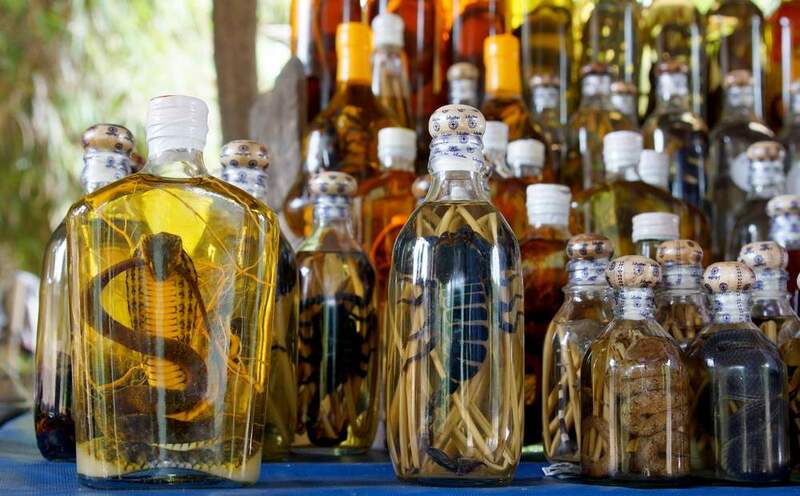 Snake wine is rice wine bottled with a venomous snake. It has a slightly pink colour like a nice rose because of the snake blood in there.It’s believed to have medicinal purposes’, but is probably more useful as a conversation piece than anything else. The snake is left to steep in the rice wine for many months to let the poison dissolve in the wine. Ethanol neutralizes the venom so it’s not dangerous. This wine originated in Vietnam, where snakes are thought to possess medicinal qualities, but has spread to other parts of South East Asia and Southern China. Snake wine shouldn’t be confused with the potentially more dangerous snake blood wine, made by slicing the belly of the snake to let the blood drain into the wine and served immediately. Photo credits: Shutterstock.com, LUC KOHNEN/Shutterstock.com, RaindyQ /Shutterstock.com, Peter Stuckings /Shutterstock.com, Hariraya /Shutterstock.com, 9george/Shutterstock.com, Marina Khlybova /Shutterstock.com, successo images /Shutterstock.com, Bhakpong /Shutterstock.com, Chantal de Bruijne .